One of the very frequently encountered errors on the VLC media player is “VLC Building Font Cache”. VLC media player is one of the most popular media players across and people just love using it due to its intuitive interface. Besides, VLC offers far more features than any other media player over the internet. It’s absolutely free and open source software, supports almost all the media files, its fast, reliable and a lightweight software and belongs to the compulsory list of Software which needs to be on our computer. But as we know, nothing is perfect and so is the VLC media player. Despite so much flexibility and integrity, VLC media is known to be facing a common building font cache error. This is how the error pop-up looks like. When ‘VLC media player building font cache’ error occurs, you have to wait for around 5-10 minutes in order to VLC player to resume playing your media file, or sometimes building font cache VLC also hangs the VLC pushing you to force close it. In this guide, we will be walking you through the reason for VLC building font cache error and a simple workaround to fix this error. Read along! Before resolving any error on our computer, it’s really important to go a little in-depth to that article and know what that issue is about and why its occurring. Thus, we have subdivided our article into two parts. The first part illustrates the reason for VLC building font cache error and the second part of the article tell you about the solution of this error. So now without making any unnecessary delay, let’s get started with the guide. What is VLC Building Font Cache Error? When we install the VLC media player on our computer for the first time, it rebuilds the fonts cache on our computer in order to show the subtitles of the video file which is playing on the media player. Rebuilding the cache for the first time is a usual practice and there is nothing to be worried about. But VLC has the tendency or you can call it a fault that it rebuilds the cache every time we opt for playing a video on the VLC. It also happens when any new font is added to our computer system. The purpose of rebuilding cache every time and again is simply to render the new fonts on our system in order to display the subtitles. But when VLC keeps building the font cache for endless time, it becomes too annoying and unbearable. Now since you know the VLC cache building error occurs due to the new fonts rendering and to display the video subtitles on the media player, you must have got a little bit of idea that if VLC is prevented to rendering the new font every time the VLC media player has started, we can just resolve the issue. Isn’t it?? This is what we are going to do. We will tweak the VLC media player settings to make it ‘Dummy font renderer’ from ‘Automatic’ to prevent it from rebuilding cache repeatedly. Here’s how do we do it. Step 1. The first and foremost step to be followed in order to resolve VLC building font cache error is to launch the VLC media player. When done, just move your cursor to the menu bar and click on Tools. See the screenshot below. Step 2. On doing that, a list of Tools options will be abruptly opened. Now you need to go to the Preferences. If you can’t find the option, just have a look at the below screenshot. 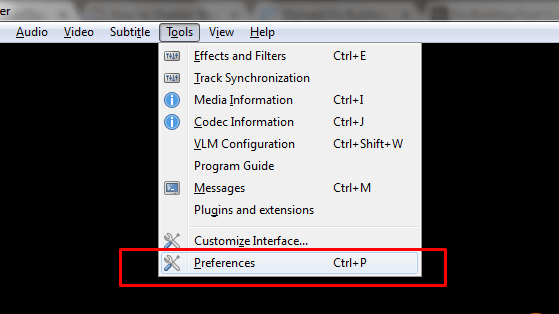 Or you can also use a combination of shortcut keys Ctrl+P to reach out to the preferences window. Step 3. As sooner you click on preferences or press Ctrl+P keys altogether, a Simple Preferences window will get popped up. 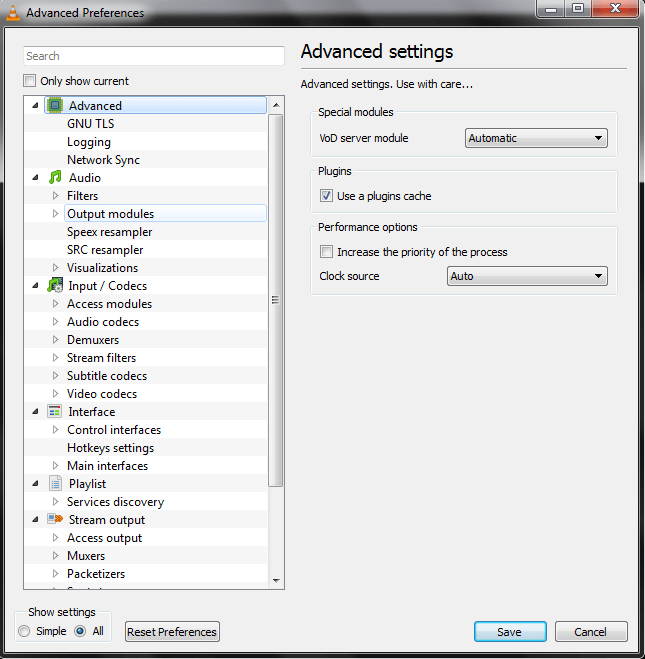 In order to resolve the given issue, we need to get our hands on the complete VLC settings. So just move your cursor to the left bottom corner of the Simple Preferences window and under Show settings, select the radio button next to All. If you find it difficult to locate the option, just refer to the below screenshot which I’ve gathered for you! Step 4. On selecting the All option, you will be redirected to the Advanced Preferences window which looks like the following screen. Step 5. Now you need to drag the slider to the last and click on the very last option i.e. 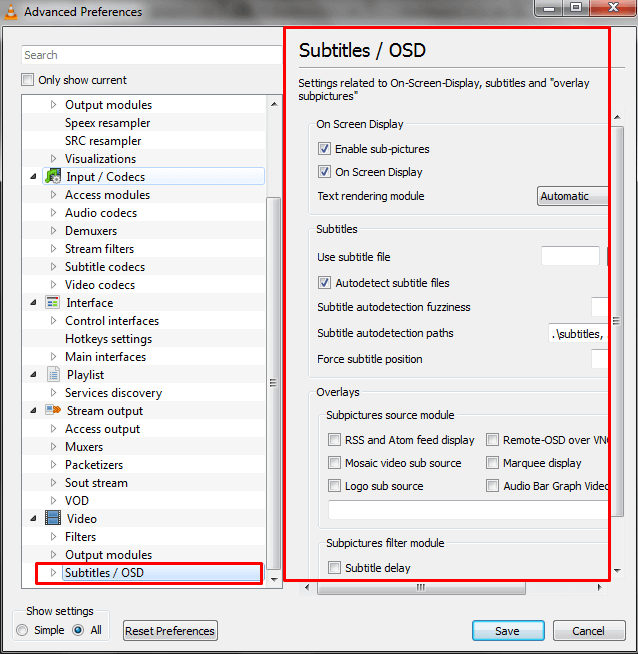 Subtitles/ OSD. 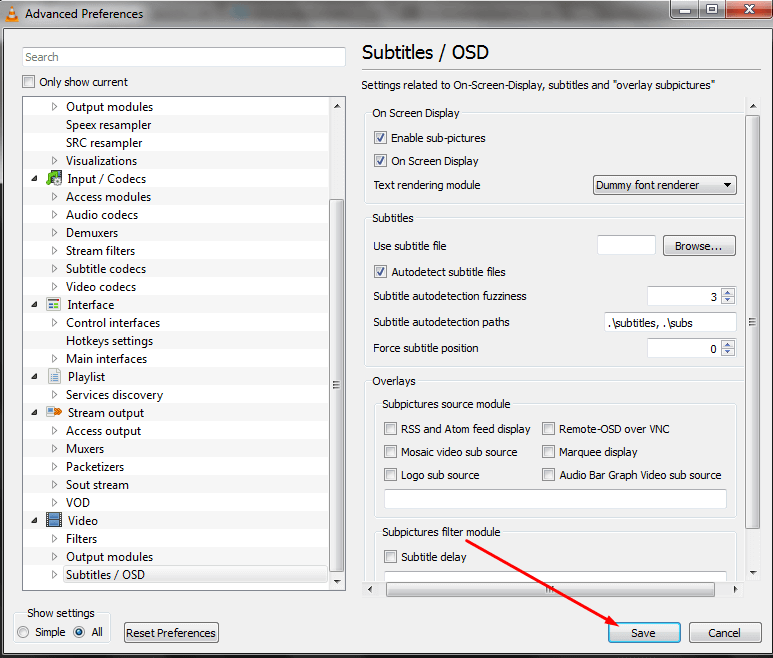 As sooner you do this, the right half of the window starts to display the Subtitles/ OSD settings. To understand my sayings better, just have a look to the below screenshot. Step 6. 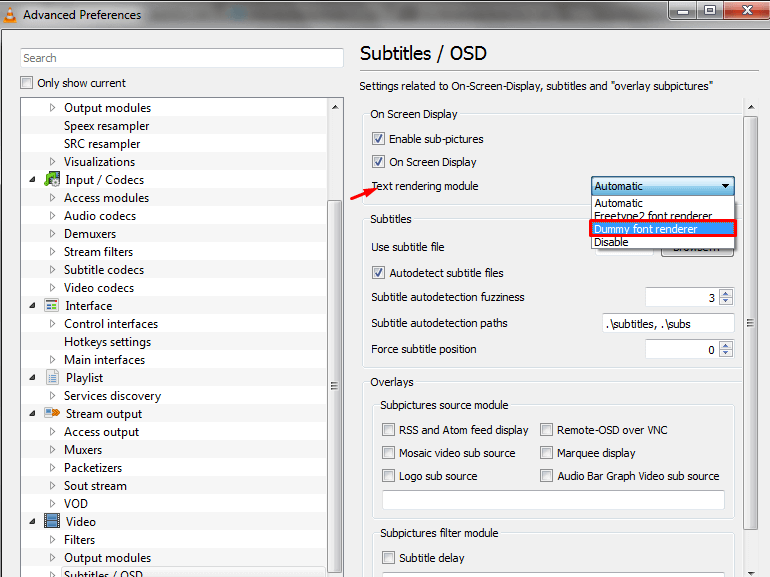 On Subtitles/ OSD settings, as you can see, under ‘On Screen Display’ the Text rendering module is set to ‘Automatic’. We need to change this option to ‘Dummy font render”. To help you understand the settings better, I’ve grabbed a screenshot for you. Just have a look on it. Step 7. Once you are done customizing the settings, click on the Save button on the bottom of the windows to make the changes take effect. Once you are done with all the changes, there are pretty good chances that VLC building font cache error will get resolved at your end. But in case the problem persists, you can also try the second method, you never know if the method 2 works wonder for you! 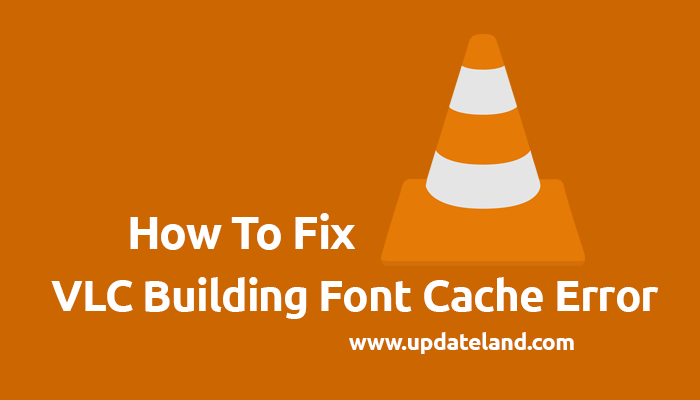 There is the simplest tweak which you can try to solve the VLC building font cache error. In order to apply this trick, you need to open the RUN window. To do that, just Click on the start menu, type in RUN in the search bar and press enter. Or simply press the Windows+R keys together to launch the run window. 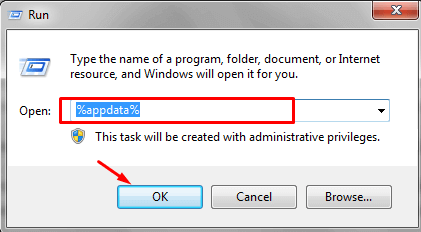 As sooner the RUN window is launched, just type in the %appdata% command and press enter. By doing that, you get to encounter the AppData Roaming window. There, search for the “VLC” folder and delete it. And that’s it. You are done! 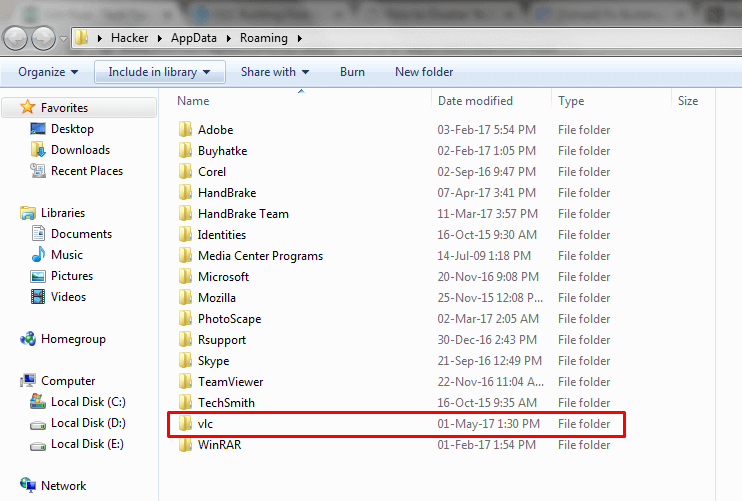 See the below screenshot to know how the folder looks like. 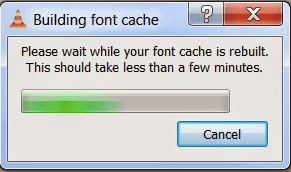 By following the above two methods, there are pretty good chances that you have managed to troubleshoot the VLC building font cache error by now. But in case if you are still facing issues with your VLC media player, make sure you are using the current version of it. If you are running an older version of VLC, update it to its latest version ASAP. You can easily do that by clicking on the ‘Help’ menu> Check for updates. If you see there are any updates available, just make sure to update your VLC media player to the latest version. Updating any software to its latest version resolves most of the issues you are facing on your system. But if that doesn’t solve the problem, you are left with no other choice than to delete that software and reinstalls it. In our case, it’s VLC media player which is causing the problem. So, without making any further delay, just try the last solution i.e uninstall the VLC from your system and reinstall it. On doing that, there are no any chances left that you will still face the VLC building font cache error. VLC is indeed one such media player which is full-fledged in terms of easy interface, features, and of course, flawlessness. Apart from just playing any audio and media file, VLC media player lets you record your screen, convert media formats from one to another, works as a youtube downloader and certainly, the list of features is pretty long. But still, VLC do have some faults like any other perfect software and one such error is VLC building font cache error. But at least, the error is resolvable and anyone with basic computer skill can fix this problem very easily. After going through the reason and solutions for VLC building font cache error, I hope you are now enjoying using VLC media player with no any issues.